There is a bottle of mostly full Kentucky bourbon that has been sitting on our kitchen counter slightly hidden behind the coffee maker and collecting dust for months now. We had big plans for this bottle of booze, ushering in the summer with refreshingly tart strawberry-bourbon lemonades and this bourbon-soaked cherry pistachio ice cream. There was a time when that bottle would have been the recipient of much attention and praise. Instead, it sits alone as life inevitably happens around it, watching us pass back and forth, back and forth, grabbing cold beers from the fridge or making trips to the basement for bottles of Pinot. 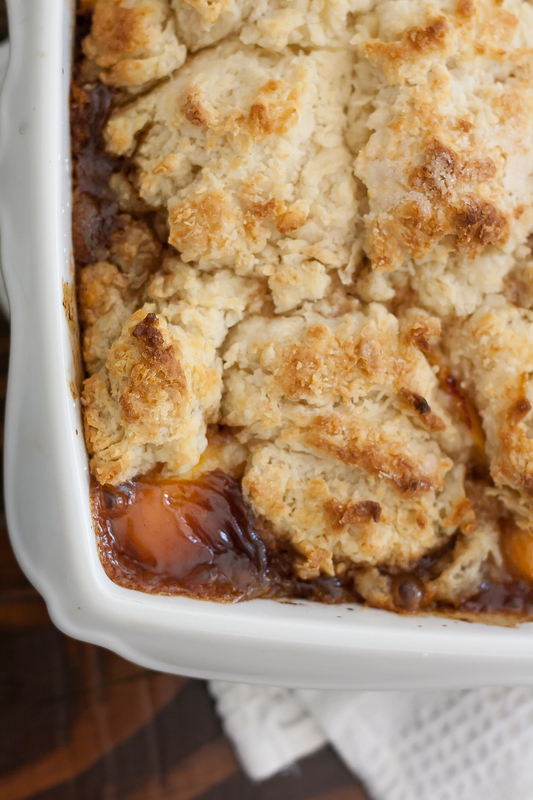 When Craig asked me to make fresh peach cobbler for his birthday, I was thrilled...mainly because cobblers take no time at all to throw together, but also because it meant I could dust off that bourbon bottle and try a flavor combo I've been daydreaming about lately. I think I will always prefer a fresh peach to a cooked one, but the addition of a little booze here makes me reevaluate that. Bring a large pot of water to a boil. Score the bottoms of the peaches (cut an "X") and drop them into the boiling water. Let them sit for a couple minutes, then remove. Use a pairing knife to pull the skins off. Cut the peaches in half, working the knife around the pit. Twist to open the peaches and remove the pits. Slice into wedges about 1/2" thick. In a bowl or 9"x13" baking dish, combine the sliced peaches and the rest of the ingredients for the fruit layer. MIx just to incorporate. Pour fruit mixture into bottom of 9"x13" baking dish (ungreased). Prepare the biscuit dough: In a bowl or food processor, mix together the flour, sugar, baking powder, and salt until well incorporated. Add the cold butter cubes and cut into the dry mixture with your fingers (or pulse it a few times if using food processor) until the texture is a course grain. Add the milk and stir with a wooden spoon until the dough comes together (again, if using processor, pulse until dough comes together). It will be wet and lumpy. No need to roll out dough (unless you like a smoother appearance). Just drop large pieces of dough onto the top of the fruit layer. Try to aim for the same thickness of the large dough pieces so they will cook evenly. If you don't mind a rustic look, pour the rest of small dough bits over the fruit as well. Sprinkle more sugar on top of the dough if you like. Bake at 425 F for about 25 minutes or until the fruit mixture is bubbling and the biscuit topping is nice and brown. You can also use overly ripened peaches for this dessert. The fruit layer will be a bit softer but still delicious.